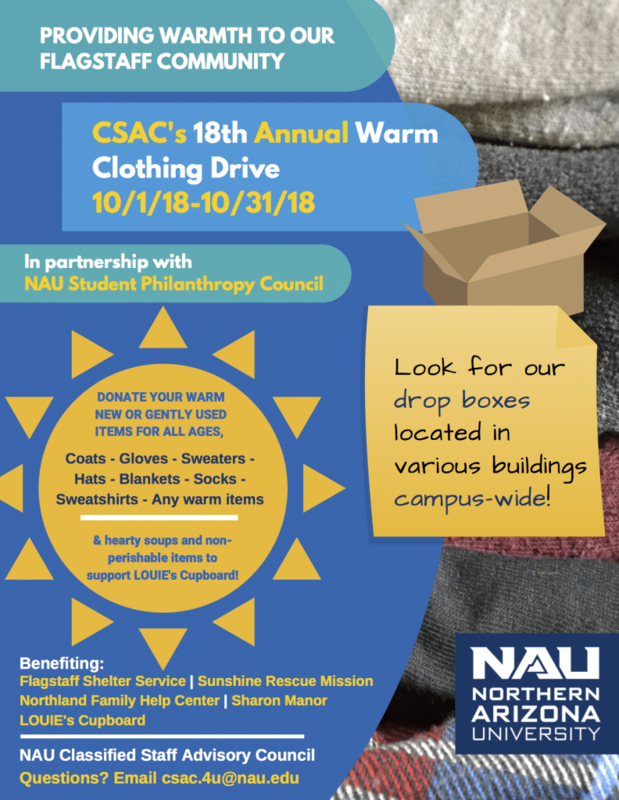 The Classified Staff Advisory Council is hosting its 16th Annual Warm Clothing Drive now through Oct. 31, in partnership with the NAU Student Philanthropy Council. Donations of new and gently used coats, sweaters, gloves, hats, socks, sweatshirts, blankets and any other warm items are being collected at drop boxes campuswide. These items benefit the Flagstaff Shelter Service, Sunshine Rescue Mission, Northland Family Help Center and Sharon Manor. In addition, CSAC is accepting non-perishable food items to benefit Louie’s Cupboard, NAU’s on-campus food pantry for in-need students and faculty. The council is also looking for volunteers to help sort the collected clothing and food items on Nov. 6-7. To register to volunteer, please contact csac.4u@nau.edu. Is there a list of buildings where these collection boxes will be located? I have quite a bit of clothing I’d like to donate, but I’d rather not have to wander around campus looking for a box. And will they be accepting food donations in the same boxes, or will the food donation boxes be located in different places than the clothing collection boxes? Thanks in advance to anyone who can provide info! Food can be dropped off at the First Gen office in the University Union. Where does the committee members drop off the collected items? I had someone show up to my office but wasn’t informed specifically where within Emerald City. Thanks!